Several games on the Jaguar are more fun to play if you have a rotary controller (there's Tempest 2000 of course, but also Kobayashi Maru by Reboot for example). 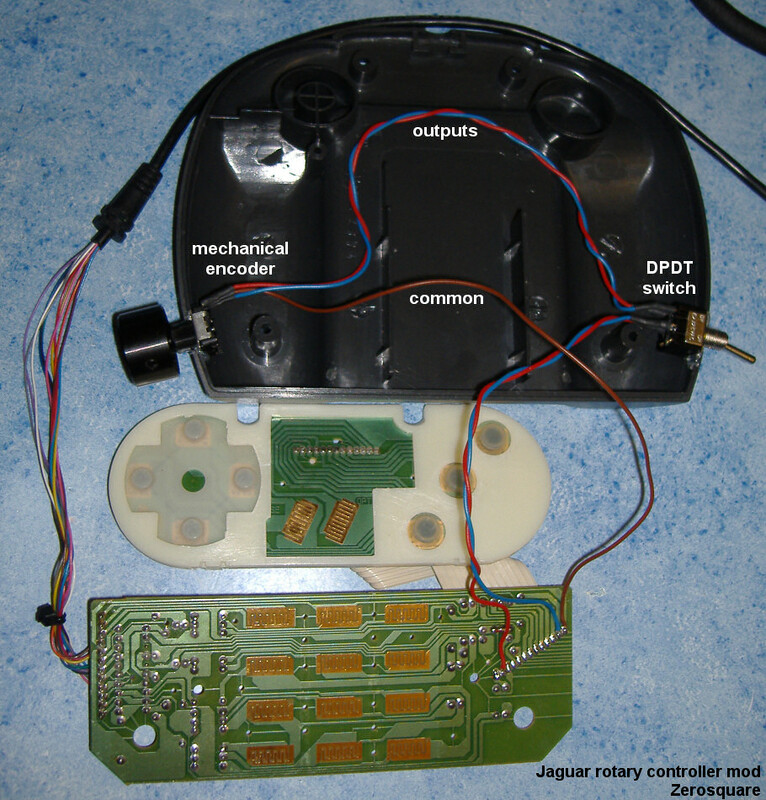 Here's a little tutorial to build one from a standard Jaguar controller, without losing the ability to use the D-pad for "normal" games. - a mechanical encoder, preferably without detents (i.e. that rotates freely without "clicks"). The number of steps per revolution will determine how sensitive the knob is ; 24 to 36 steps is fine. - a DPDT switch. It will be used to switch between "normal" and "rotary" mode. The encoder, knob and DPDT switch are not very expensive ; I paid 5€ (about $6.50) for all three. The first step is of course to take your controller apart. The screws are hidden under round, adhesive pieces of rubber ; lift them gently with a screwdriver. Before closing the controller, check that everything is working fine. If the rotary part works backwards, swap the outputs of the encoder. 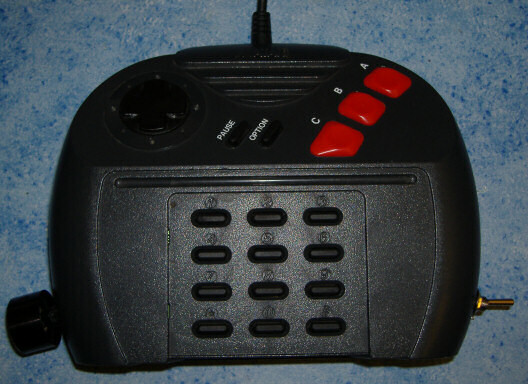 To use rotary controllers in Tempest 2000, you first need to enable the hidden option. But if you only have one controller, you're stuck, because you need to have two controllers connected and hold the Pause button on both. This will simulate holding the Pause button on the right controller. With the wire in place, just press Pause on the left controller, and you'll unlock the option. Once this is done, you can remove the wire and throw it away -- you won't ever need it again, since Tempest saves the setting in the cartridge memory. Very great thing Zero Two questions, the red wire is soldered on the first or second plot on the left ? And the second one is, where the Rotary is putted it's not difficult to play ? the red wire is soldered on the first or second plot on the left ? It's on the second pad from the left. And the second one is, where the Rotary is putted it's not difficult to play ? Zerosquare is being a bad boy again, he's demystifying Jaguar stuff again . Great stuff! By the way, I've patched T2k so you don't need to press anything for the hidden controller menu to appear. So less stuff to remember . Anyone interested? Jeff Minter made Tempest 2000 free a few years ago, so I think it's OK.
Made one of these zeortary controllers, works well (although I had left/right the wrong way 1st go, oh well, I expected it ). Used a 24ppr no detents encoder, works nicely. Have enough bits to make some more, works out at £2 for each pad for the encoder, switch and knob - bargain! Well, here you go: http://users.hol.gr/~ggn/stuff/Tempest%202...y%20Enabled.ips. You still need to plug in a regular pad to select the corresponding menu - I might fix that to default to rotary at some point. Even if you have a nice rotary with a switch?